Peter Barlow Guilty of Murder? You Decide! Will Peter Barlow be found guilty of murdering Tina? That’s the big question over at Coronation Street as the Tina murder comes to a head. Peter isn’t exactly an innocent guiltless person is he? I mean he’s guilty of adultery if that’s not bad enough — but murder? What do you think? Is he guilty or not? Let us know in the comments below. With friends like man-on-the-verge-of-a-nervous-breakdown-Steve McDonald, Peter Barlow certainly doesn’t need any enemies. The depressed taxi driver went from vague to pointing the guilty finger straight at his friend when he appeared in the witness box during the showpiece trial on last night’s Coronation Street. “How would you feel if your best friend murdered his girlfriend and it was all your fault?”, he told the packed courtroom as the cameras zoomed in on Michelle’s perfectly made-up eyes squeezing narrower and narrower to show she was puzzled by her husband’s strange behaviour. As at least half the Corrie cast decamped to Weatherfield Crown Court for the day, Roy Cropper told the jury that alcoholic, cheater, Peter, looked agitated as he left Tina McIntyre’s flat on the night the barmaid was found near to death on the cobbles. What tangled webs we weave — and Coronation Street writers are the best at weaving those tangled story lines together. They’ve done a doozie on this one, haven’t they? 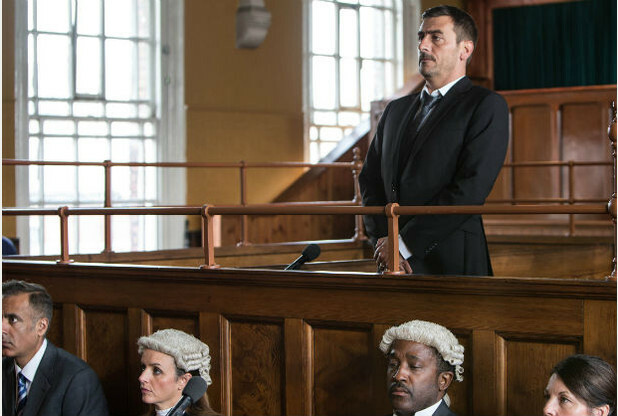 Peter Barlow may be guilty of several offenses, but is he guilty of murder? And why did his best friend Steve MacDonald point the guilty finger at Peter in court when he wasn’t innocent in the affair either. We’ll have to wait to see how this pans out, but my bet is on the guilty verdict — what do you think?